Situated on the 1st floor of a beautifully renovated period building adjacent to the main house, the suite has 1 bedroom which can be configured as a king size double or 2 single beds and a large light and airy open plan living / kitchen space. 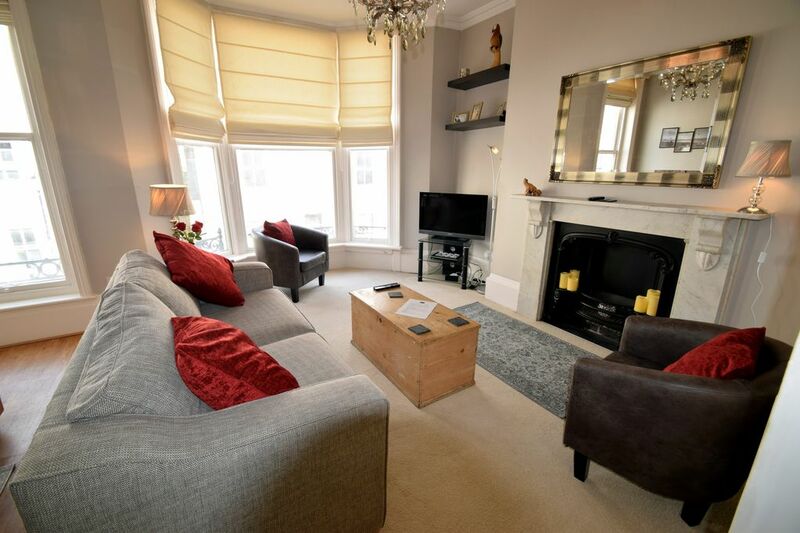 Ideally located just a few steps from St James Street in fashionable Kemptown, and five minutes walk from the pier and the Pavilion. The apartment features a flat screen TV and free WiFi throughout. The kitchen is fully equipped with full size hob, oven, fridge and freezer, together with dishwasher, and all the usual small appliances. All crockery and cutlery are provided of course, as are linen and towels. The living area features a double sofa bed, enabling up to four guests to enjoy the comforts of this stunning apartment. Bluetooth speaker to play your own music. Beautifully decorated apartment in a central location. It is a quiet street, walking distance to everything. The hosts were very nice and responsive. Recommend. We had a very comfortable stay in the annex over a long weekend. The flat is in great condition, comfy and had everything we needed. Would stay again. Geniale Lage, sehr gutes Boxspringbett.